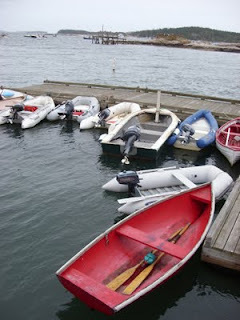 Sunday was a gray day, and I had some worries that it would be more than damp in Stonington - another of my favorite destinations when I am staying in Castine - but it turned out quite nicely. No sign of any fog as I crossed the bridge over Eggemoggin Reach, and the light drizzle ended completely when I reached Stonington. I had a wonderful late lunch at the Fisherman's Friend, where I had the lobster cold plate: a hefty portion of Stonington lobster (already shelled) with fresh fruit, cucumber, tomato and cottage cheese. It was terrific. Then I wandered down a nearly deserted Main Street and stopped in some of the shops that were still open. It made me sad how very quiet it was. 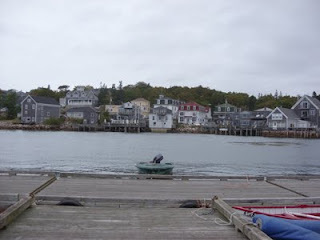 After my shopping excursion, I walked back to my car and took a detour onto the floating docks to take the above pictures of the harbor and the village. 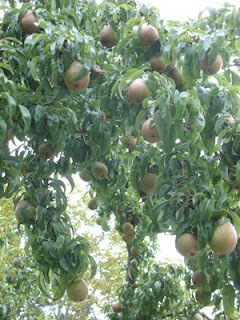 But before I returned, I found this pear tree in full fruit on the farther end of Main Street. I wondered if anyone was going to pick some of this bounty hanging so plentifully. And this swatch of toadflax caught my eye, too. 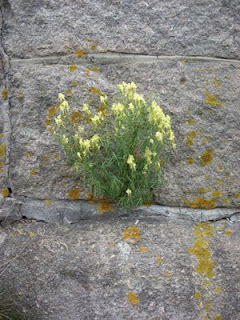 One cannot but adore the tenacity of plants and how they can cling to life in the most inhospitable locations. Can you believe this one is growing out of the mortared crack between the rocks?